'One of the most splendid works in Ipswich Town Library is the 'Deske Ortelius' a large world atlas, presented shortly before his death in 1631 by John Causton, rector of Clopton and Otley. Born in 1567, he was prepared at North Walsham School for entry to Corpus ChristiCollege, Cambridge, aged fourteen; there he took his MA, BD and a fellowship. His brother Leonard was three years behind him at Corpus and also came to Suffolk, flourishing as an Ipswich merchant and living in Pykenham's House in Northgate Street. When he died in 1618 Leonard left generous bequests to the poor of St Mary-le-Tower parish. 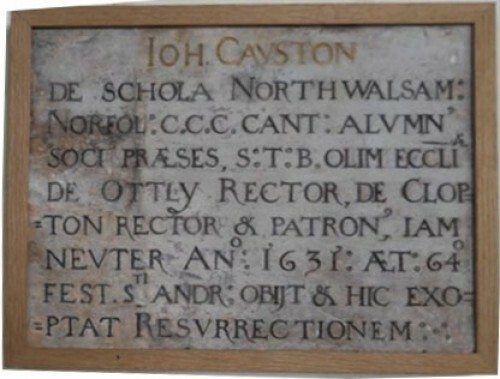 The article concluded with the words 'Of his modest memorial tablet in Clopton church, only fragments found in the churchyard remain; how nice if it could be repaired and refixed on the chancel wall. He "earnestly desired his resurrection". Dr Blatchly visited the church with conservator Antonia Hockton and they decided that the missing pieces of the alabaster memorial could be made to restore it to its original form. Grants for the work were obtained by Dr Blatchly and John Causton's memorial was repaired and replaced once again on the chancel wall. Nobody knows why it was broken and buried in the churchyard. and here expecting his resurrection.